Di-Va! Show all of your girlfriends you are the Diva by wearing the Glittered Diva Boppers with Marabou. It is a black fabric covered headband with gold metallic springs, and black Marabou surrounding the base of the springs. 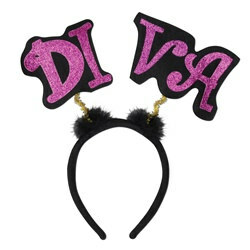 Extended from the headband are pink glitter-coated fabric letters creating the word DI-VA. This bopper fits a full head size. One Glittered Diva Boppers with Marabou per package. Sorry, due to hygiene related concerns this item is non-refundable.